Insight begins with a reliable foundation. Strong data analysis and delivery requires a solid data warehouse and governance surrounding it. The data warehouse is your repository of electronically-stored data. It’s the single version of truth and the source of data for your reports and dashboards. 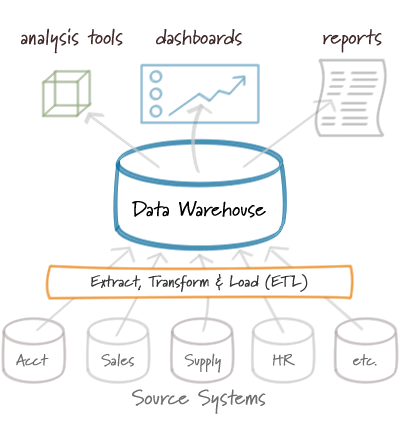 Data is fed into the data warehouse from the business transactional systems (accounting, sales, HR, and others). An extract-transform-load (ETL) process gathers data from these source systems, translate the data into a common and compatible format, and load the data into the data warehouse. Using a single source for all the corporate reporting data allows reports and analysis to view data combined from all of the company systems. Data governance is the process and order that ensures data quality, data management, business process management, and risk management surrounding the handling of data both in and out of the data warehouse. Conventional wisdom states that there is a trade-off between speed and safety. To maximize the speed of access without compromising strict data integrity, the warehouse must be both designed carefully and managed effectively. StatSlice consultants have designed data warehousing structures in a wide variety of industries supporting many business functions. We deliberately design and help you implement a data governance process that is shielded by the right security and integrity structures but open enough to efficiently feed the reporting tools that help you make better decisions. Regardless if you’re looking to get started on a data warehouse project or need performance tuning for your existing architecture, StatSlice provides expert help. Call or write us today to discuss your project needs.